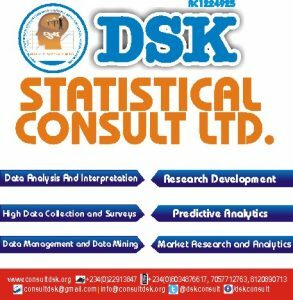 Our Services – DSK Consult Ltd.
DSK Consult employs advanced methodologies, scientific techniques and standard research tools in the research process. We strive to not only present you with accurate results, but to ensure that you understand the analytic techniques utilized to obtain those results. We are equipped to meet your research needs to ensure that your research is a success. SPSS, SAS, EViews, R, MS Excel, STATA, Minitab, Gretl, and other recognised statistical software are used effectively and efficiently.